Hurricane Irma regained power and its Category 4 status on Sunday morning before making landfall in the Florida Keys, with storm surges in the islands potentially reaching up to 10 feet. “Hurricane-force winds extend outward up to 80 miles (130 km) from the center and tropical-storm-force winds extend outward up to 220 miles (350 km),” it added. The National Weather Service’s Key West office tweeted water was three feet above normal as of 9:36am ET, adding the storm had continued to move northwest on its trajectory toward the Tampa area. According to the NHC, Tampa Bay could see surges of five to eight feet. According to the Associated Press, some 30,000 people evacuated the Keys but “an untold number refused to leave, in part because to many storm-hardened residents, staying behind in the face of danger is a point of pride.” Approximately one million people were without power, and an estimated 127,000 were in shelters. Though the Miami-Ft. Lauderdale-West Palm Beach corridor on the east coast avoided a direct hit, footage posted by CNN showed the area experienced extreme winds and damage downtown. At least one construction crane, one of many in the area put at risk by high winds, partially collapsed in downtown Miami. Irma was projected to retain much of its strength as it headed up the west coast; since it will remain on or close to the coast, it will be able to recharge power from unusually warm waters in the Gulf. Update 5:03pm ET: Later in the day, Irma was downgraded to a Category 3 for the second time but continued to plow northwest. 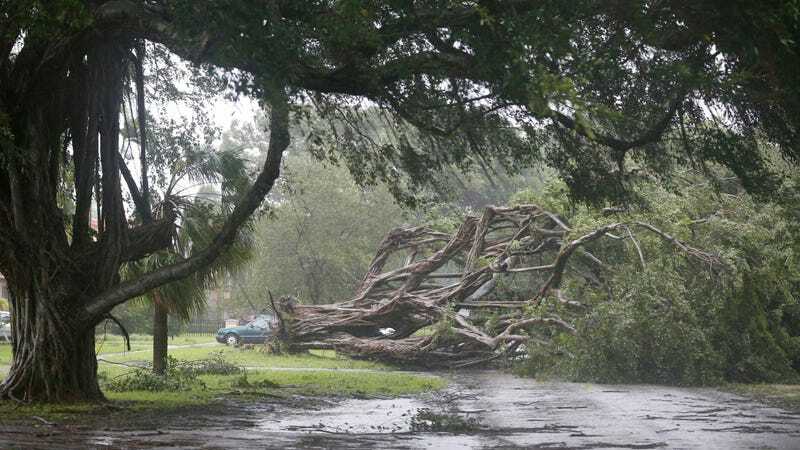 It made landfall for the second time on Marco Island in southwest Florida, with winds reaching 115 mph (185 km/h). Video showed the storm battering the island as it passed. Irma is headed on a direct course for the nearby mainland city of Naples on the southwest side of the peninsula, where conditions are very bad. At Naples municipal airport, NWS Miami reported it had recorded a 142 mph wind gust. The NWS also put much of the region under flash flood warnings. In the Cape Sable to Captiva region of southwest Florida, where Naples is in the middle of, the NHC predicted storm surge could reach 10 to 15 feet. As the storm moved northwest, it left behind destruction in the Florida Keys. Throughout the islands, people hunkered down in reinforced sections of buildings, roofs ripped off buildings and winds blew out the interiors of homes and businesses. Miami avoided a direct hit, but there was still considerable flooding throughout downtown and other neighborhoods, with feet-high storm surge turning parts of the city into a veritable river. The NWS Miami office warned mid-afternoon that a tornado had touched down near the airport in Fort Lauderdale, just north of Miami. Update 7:18pm ET: Late Saturday, Hurricane Irma was downgraded to a Category 2 storm, but remains extremely dangerous. According to the NHC, Irma is still throwing 110 mph (177 km/h) winds, with much more powerful gusts, and continuing northwest at 14 mph (23 km/h). Initial indications were that Irma had dealt serious damage to Naples and Fort Myers, where the storm dealt a direct hit. Photos showed the storm had reduced visibility to near nothing as it threw trees and debris and surged water up streets. While Naples is currently dealing with storm surge in the storm’s wake, Fort Myers will soon face the worst of Irma’s eyewall. The water was sucked out of Tampa Bay as the storm, which is rotating at high speed, drew water out to sea; that water plus up to eight feet of storm surge is expected to return later when the storm hits the city directly. Numerous social media posts as well as live coverage on cable news showed curious locals walking out into the now-dry seabed, which experts cautioned is a bad idea. “It is within the realm of possibility that (the water) comes back more dramatically than if it were just a surge blowing up on land without the water being removed from the shore areas by the winds ahead of the eye of the storm,” Louisiana State University Center for Coastal Resiliency director Scott Hagen told CNN.